When nobody was looking, this... thing crawled out of the Bottomless Grave and nobody has been able to get it to leave. But since it hasn't been any less effective at catching mice, nobody seems to mind very much. The Thing That Ate The Bottomless Grave Skin can be used on the Bottomless Grave. The trap's stats (power, power bonus, attraction bonus, etc.) are not changed. The Thing That Ate The Bottomless Grave Skin may be made available during the annual Halloween event and can be traded on the Marketplace or through Give To Friends. 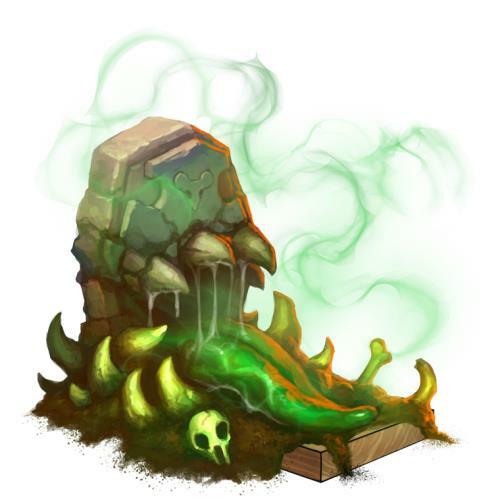 17 October 2012: The Thing That Ate The Bottomless Grave Skin was released on at the start of the Halloween 2012 event. It was available for purchase for 125,000 gold and 9 Cobwebs at the Haunted Terrortories Trapsmith.